Property Location With a stay at Pod 39, you&apos;ll be centrally located in New York, minutes from Chrysler Building and Grand Central Terminal. This family-friendly hotel is close to Empire State Building and Macy&apos;s.Rooms Make yourself at home in one of the 366 air-conditioned rooms featuring LCD televisions. Complimentary wired and wireless Internet access keeps you connected, and cable programming provides entertainment. Private bathrooms with showers feature rainfall showerheads and designer toiletries. Conveniences include laptop-compatible safes and desks, as well as phones with free local calls.Rec, Spa, Premium Amenities Take in the views from a rooftop terrace and a terrace and make use of amenities such as complimentary wireless Internet access. 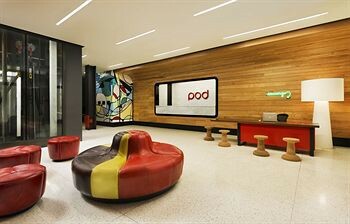 Additional features include babysitting/childcare (surcharge), an arcade/game room, and a fireplace in the lobby.Dining Enjoy a satisfying meal at a restaurant serving guests of Pod 39. Full breakfasts are available daily for a fee.Business, Other Amenities Featured amenities include complimentary high-speed (wired) Internet access, a computer station, and dry cleaning/laundry services.